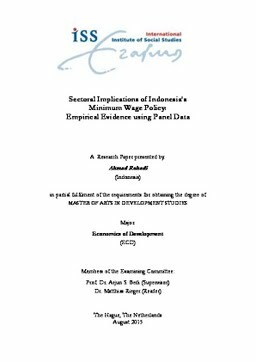 The absence of consensus of minimum wage effect on employment engenders study on this field remains a favour. Yet, little researches studied the functioning of minimum wage policy on sectoral employment comprehensively. Exploring Sakernas data of 2004-2013 in province level and sectoral-province level, this study notifies positive impact of minimum wage on general employment. This study also maintains that minimum wage is beneficial for rural, female, married, low educated employment. Minimum wage is empirically proved attractive for workforce to become a worker rather than an entrepreneur. Divergent effects of minimum wage on economic sectors appear regarding to characteristics of economic sector. Agricultural, forestry, hunting, and fishing sector; construction sector; wholesale trade, retail trade, restaurant and accommodation sector; finance, real estate, insurance, and business services sector; and community, social, and personal sector, which are labour intensive, positively affected by minimum wage increases. In contrast, transportation, storage, and transportation sector is adversely affected by minimum wage hikes. Analysis on minimum wage effect on specific group of employment implies that low-educated labour is not favourable in seven of nine sectors of economy.